I think I’m finally making a dent in my odd ball stash! A few more hats, a bit of creative rearranging, it’ll all fit into one bag! It’s going to be a large bag, but still…this is amazing! I don’t think my stash has ever, actually, gotten smaller. Until now! Just in time for Rhinebeck! At last week’s used book sale, I picked up this little dandy for $2. I’ve always liked the idea of a bouquet of knit flowers. I won’t ever do it, but it’s a nice idea! No, what I’m envisioning is a hat, something fit for Carmen Miranda or Esther Williams. So far, I’ve got a daffodil, a hibiscus and a peace lily. I think maybe a water lily or a poppy next! The order doesn’t really matter though. I think this headwear masterpiece needs one of each! Oh yes! The yarn is Tosh Merino and two skeins is a lot of yardage when it comes to hats! This is my third hat from this yarn. I also got Heisenberg and my Greensky Bluegrass hat from the same two skeins! And I’ve still got 45 g left! That should be enough for a kid hat. A dinosaur, I think! I’m an organic chemist by training. I spent 15 years in the lab doing research. There’s an old saying about the motivation of people who go into chemistry, you’re either a drug chemist or a bomb chemist. Unless you’re Walter White, then you’re BOTH! Don’t mess with him. He means business and he’s not afraid to use science. Yes, this is Heisenberg AKA Walter White from Breaking Bad. I adored that show from the get go. I’ve always wanted to knit some of Jesse Pinkman’s beanies but they’re standard store bought fare. They aren’t jumping to the top of my list anytime soon. 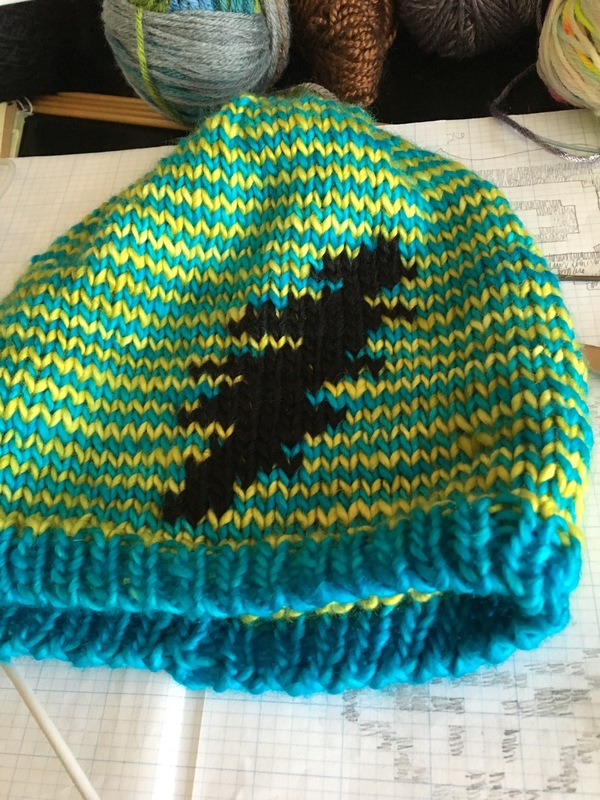 So, when I saw the Heisenberg Cup Cozy pattern, I knew that chart needed to be on a hat. I had to use the acid green Tosh Merino in my stash. It fit perfectly! I don’t wear hats often but I think I’ll be making an exception with this one! I love it!